Similar to the Bonjour Screen, this enables the Jabber side. Unlike Bonjour that uses your Address Book this require a Jabber Screen name but like the AIM/@mac screen but it is linked to the Address Book as you go and does not need that data (Real Name) to be entered again. 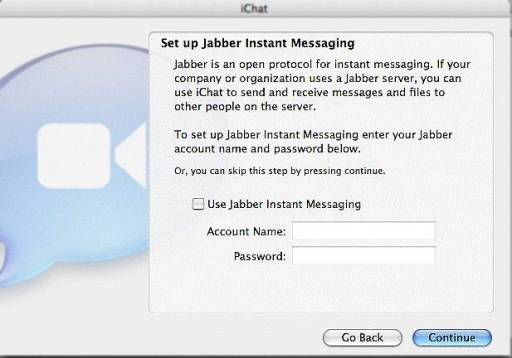 iChat does not have what is caaled a Jabber Registration module so you havbe to have a Jabber ID first if you want to enter it here. For more on this see the top three links in page 5 (Jabber in Tiger). You can of course set up a Jabber ID as a New Account in th iChat Preferences later if you do not have one at this point. The Jabber activation Screen. It requires that you have the name/ID first. If you do not then do not select this to be active right now but set up a Jabber ID and enter it in the iChat Preferences > Account section later.